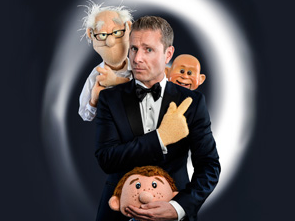 Fresh from his Season 10 victory on NBC’s America’s Got Talent, Paul Zerdin and his band of sharp-tongued characters bring their comedy and hilarious antics to The Las Vegas Strip in an all-new, headlining production. With Paul’s winning combination of technical skill, hilarious ventriloquism, charm and impeccable comic timing, he brings to life several very different characters that over the last year have become household names in the United States. From appearances on the UK’s Royal Variety Performance to delighting and impressing audiences at comedy festivals around the world with his powerful stage presence and his fresh twist on this traditional comedy art, Zerdin is constantly breaking new ground and establishing himself at the forefront of his profession. Called the “ventriloquist for the South Park generation,” the master ventriloquist brings the whole gang - including Sam, Baby, and everyone’s favorite belligerent old man, Albert – to Las Vegas in this live, fully-fledged stage production that has audiences bursting with laughter and astonished by his unfathomable skill.